bolivia. manufacturer of fabrics and apparel such as t-shirt, polo, t-running pants and strap tanks. bolivia. manufacturer and exporter of 100% alpaca knitwear. includes a company profile, collection photos and fiber information. About the climber, her books, expeditions, and speaking engagements. Expedition reports and photos from Lohtse, Aconcagua, Everest, Bolivia, and Ruwenzori. Translation, official translation and interpretation in English and Spanish. Based in La Paz, Bolivia. Imports and distributes specialty food products from Greece and Bolivia. Based in the USA and Switzerland. Bolivia. Design and manufacture of hand woven carpets and rugs, from Alpaca wool, acrylics and polypropylene. Shows selected photographs of outdoor sports, nature, and travel from North America, Bolivia, and Eastern Europe. Mountaineering and rock climbing are specialties. Bolivia. Manufacturers of nubuck and nappa, crust and wet blue tanned, dyed and printed bovine, goat, sheep, lizzard and llama leathers for footwear and leather goods. Also, ready-made work shoes and bags. Wholesaler of organic quinoa in the form of whole grain, flakes, and flour. Located in La Paz, Bolivia. Includes details on the company, and grain, news and recipes. 10 Promociones Gloria Official preliminaries. Official preliminaries. Miss Universe Bolivia. Miss Universe Paraguay. Miss Universe Uruguay. Tienda en linea de artesanÃƒÆ’Ã‚Â­as. Offers textiles, paintings, fine arts and reference books from Guatemala, Ecuador, Mexico, Bolivia, Peru and Cuba. Functional and decorative cultural items made in Bolivia include jewelry, masks, textiles, ceramics, wood and home accessories. Details and sample chapters from the book charting a three-month journey from Buenos Aires to Tierra del Fuego and back via Chile and Bolivia. Specialist alpine touring publishers of ski touring and ski mountaineering guide books to India, Peru, Bolivia, Australia and Canada. Hostelling International in Bolivia. Property details, FAQ, and image galleries available. Journal of a three week trip through Bolivia, including La Paz. Provides photos, map and daily narrative. A 5 week bicycle tour through Bolivia. Hostelling Bolivia - the home of Hostelling International in Bolivia. In English, French, Spanish and German. Photos from several peaks in the Cordillera Real. Bolivia, North Carolina. Home of Ch. Von Whelans Belaire v Tobant, CD. Finland to Bolivia. Photos and journal. Offers full service guided mountain tours in Ecuador, Peru and Bolivia. Travelogues and treks in the Andes, Amazon, Himalaya, Chitwan Nepal, and Bolivia. Three weeks exploring Peru and Bolivia. Provides photos, maps, daily itinerary and commentary. Offers climbing and mountaineering trips in Bolivia or Patagonia in Argentina and Chile. Content in English and Spanish. Offers hunting and sportfishing vacations in Argentina, Costa Rica, Bolivia, Mexico, and Brazil. Includes photos and trip details. Travel diary extracts, expedition logs and photographs from places such as Antarctica, Argentina, Bolivia, Brazil, Chile, India, Paraguay and Scotland. Outfitting company offering dove and pigeon hunting in Bolivia and Paraguay. Includes the companys history, a price list and contact details. Photographs and stories of India, Pakistan, Iran, India, Ladakh, Bangladesh, Peru, and Bolivia. Agence de voyages situÃƒÆ’Ã‚Â©e au coeur de la cordillÃƒÆ’Ã‚Â¨re des Andes dans le centre ville de La Paz, prÃƒÆ’Ã‚Â©sentant ses offres pour le pays, le PÃƒÆ’Ã‚Â©rou, le BrÃƒÆ’Ã‚Â©sil et le Chili. Trip reports of 1998 Tour of Brazil, Argentina, Chile, Bolivia, Mexico, Peru, Nicaragua, Honduras, Panama, Colombia, Ecuador, and Guatemala. Detailed descriptions of CD-ROMs Birds of Bolivia, Birds of Venezuela, and Birds of Tropical Asia. Trip to South America Peru Cusco, Machupicchu,Bolivia Lake Titicaca, Ecuador Galapagos, Chile Tower Paine, Argentina Tierra de Fuego. Bird tour company covering Peru, Bolivia, and Chile, including the Manu Biosphere Reserve. Includes detailed itineraries, photos, and articles. A 27-hole Fred Couples signature golf facility set along the Lockwood Folly River in Bolivia. Facilities, specials, membership details, and services. Offers dove hunting in Bolivia. Also offer Dove hunts and Peacock-bass fishing combination trips. Includes guide and contact information, destinations, and photographs. Tour company specializing in Ecuador, Peru, and Bolivia. Site includes Ecuador birding news. Details Student Missionarys year of 1998 living in Peru and traveling to Chile and Bolivia. About two Swedish climbers plans to climb unclimbed peaks over 5000 meters in Cordillera Apolobamba, Bolivia unsupported. Photos and journals. Birding throughout Peru, Bolivia, and Chile, including the Manu Biosphere Reserve. First round results and standings, countries, and final round results. Provides descriptions of the different mountain biking possibilities around La Paz, Bolivia. Sacred journeys, goddess tours and soulful travels to destinations such as Crete, Cyprus, France, Peru, Bolivia, England, Scotland and Turkey. Small groups and free brochures. Explores, documents and publishes information on canyons worldwide, with emphasis on Mexicos Copper Canyon, the Yarlung Tsangpo in Tibet, and canyons in Australia, Greece, Bolivia, China and the USA. Excerpts written while living in Venezuela and Colombia during 1994-98 - covering Venezuela, Colombia, Ecuador, Peru, Bolivia, Argentina, and Chile. Provides a photo gallery, geographical trip index and contact email. Small group adventure specialty camps and expeditions focussing on high level instruction in rock and alpine climbing, mountain biking, fly fishing, adventure racing and backcountry explorations in Colorado, Bolivia, the Alps and Mexico. Transformational journeys to Peru and Bolivia and shamanic workshops. Includes pictures of the construction site and general information about Columbia. The LCMRCI (or CEMICOR in Spanish) has sections in Peru, Bolivia, Britain and New Zealand. International Mission Board of the Southern Baptist Convention missionares are ministering to Aymaran immigrants in La Paz, Bolivia. Former LDS missionarys personal site includes photos of the construction site and other scenes from his mission. Run by the Buddhist Association of North Carolina, and offers meditation days and festivals. Includes teachings and a photo gallery. Sections on the history of Argentina, Bolivia, Brazil, Chile, Colombia, Cuba, Ecuador, El Salvador, Mexico, Peru, and the Aztec, Inca, and Maya native cultures. Discusses the business issues and outlook for the proposed South American Union, merging the Mercosur trade bloc of Argentina, Uruguay, Paraguay and Brazil with the Andean Community of Bolivia, Colombia, Ecuador, Peru and Venezuela. Chile, Suriname and Guyana will also be members. Reportage style images on the UK, Shanghai, China and Bolivia. Samples of published work on site. Photos of landscapes, nature, and people from Peru, Galapagos, Chile, Brazil, Ecuador, Bolivia, and places in Europe. huichol and tepehuano yarn paintings, dance masks and lacquerware from mexico, indigenous textiles from guatemala, bolivia, peru and crafts from throughout latin america. SiteBook Bolivia City Portrait of Bolivia in Illinois. 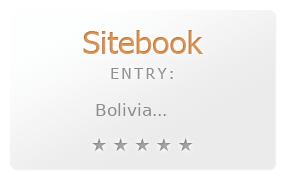 This Topic site Bolivia got a rating of 3 SiteBook.org Points according to the views of this profile site.